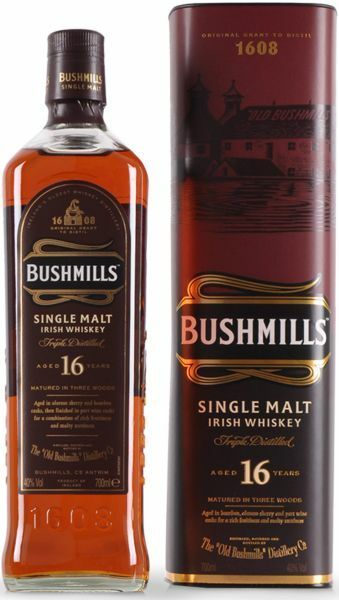 The 16 year old Bushmills builds on the soft, smoothness of the 10 year old and adds some very nice fruity characters. The whiskey is initially aged seperately for 15 years in both bourbon and sherry casks then these are married together into port wood for around a year of extra finishing. The port wood adds some delicious flavours of red fruits, some sweetness and hints of candy and chocolate. Like all Bushmills whiskeys it is very smooth but this one has a sweeter, fruitier edge than them all. Tasting Notes: Aromatic nose with hints of almonds and a nutty sweetness.